The Princess Beatrice Mary Victoria Feodora, youngest daughter of Queen Victoria and Prince Albert. Photograph, signed and dated by Beatrice, Jan. 1870. 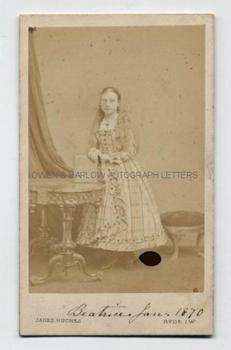 Albumen carte de visite photograph by Jabez Hughes, Ryde, Isle of Wight. It measures approx 4.25 x 2.5 inches (including photographer's mount). The 12 year old Princess is shown full length in crinoline dress of tartan stripes, with her hands resting on a photo album on an ornate tripod table. Her long hair is unbound and she gazes fixedly at the camera. There is an ink blot on the image (below the hem of the Princess's dress) which probably fell from her own pen at the time she signed it. Her SIGNATURE is in a small, neat hand and both it and the image are in fine condition. 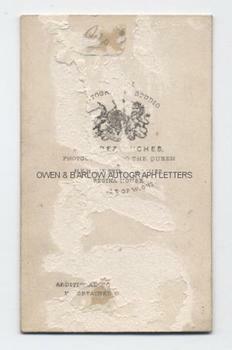 The verso of the carte has some old mounting damage which has partially obliterated the photographer's printed details. Princess Beatrice did not have an altogether happy childhood. Following Albert's death in 1861 Victoria came to rely more and more on the company of her youngest daughter, who she called "Baby" and Beatrice was to spend a large proportion of her life as her mother's constant companion. Beatrice found it difficult to find a suitable husband (or at least one that Victoria would approve). When she eventually married Prince Henry of Battenberg, Victoria imposed the condition that the couple should live with her, so that Beatrice could continue as her mother's companion and unofficial secretary. When Victoria died in 1901, Princess Beatrice devoted the next 30 years to the editing of the Queen's journals.